To investigate the issue, I tried getting the YouTube Kids apk from APK Mirror and installing it on a Nokia 7 Plus running Android 8.1 Oreo, no SIM card, and with only one Google account signed in: my Lebanese one. The app installs fine, opens, works, but if I let my phone idle for a bit and I check the app drawer, it's gone. I did this twice and the same thing happened each time after about 30-40 minutes. It's nowhere in the list of applications installed on my phone, not the disabled ones or the system ones or anything. 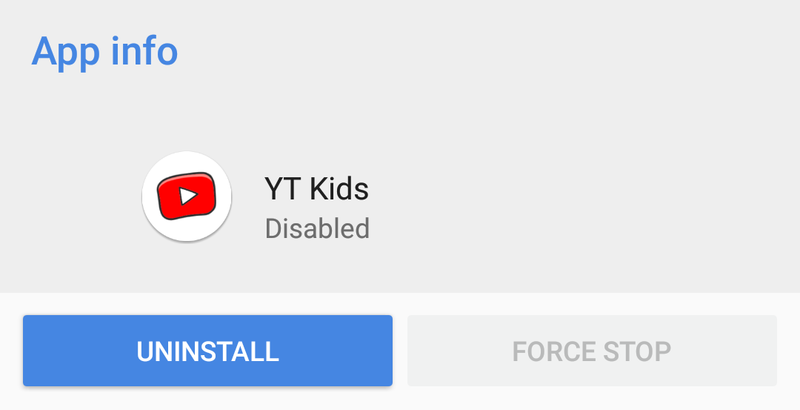 But being the smart cookie that I am, if I leave the YouTube Kids app's info page open when it is still working and wait for it to disappear, I notice that the page now says it's disabled with no option to reenable it. The only way to get access back to the app is by going to the APK file and installing it again, which logically tells me the app is already there. Nevertheless, installing again brings it back... only for it to disappear about 30 minutes later. My theory would have been that something is disabling the app on devices that aren't signed into a Play Store account in a country that officially supports it, but the online reports paint a much more varied story. Some users have a US account on their devices (and even a family and child account) and are grabbing the app there officially, no sideloading, but are now travelling to an unsupported region. So why is it not happening to my Pixel 2 XL? I have no idea. I really, really, really hope this is a bug with some versions of Android or Play Services, because otherwise we're going down a despicable ugly road if apps start being allowed to disable themselves once they detect you're outside of their supported regions. Say goodbye to sideloading APKs and start thinking twice before travelling. Once abroad, no YouTube Kids for the little ones, no Android Auto for your drive, no access to your bank account. We live in a day and age where more people than ever are hopping from one country to the next all the time and limitations like these seem more and more ridiculous and absurd. It appears that this isn't the first app that does this. Google already has a system in place to completely disable apps that aren't supposed to be on your device in your region. Google Pay is one of them, as many users have noticed when trying to enable it with valid cards from other countries, and the different Play apps and services too. If your device gets assigned to a certain market region, the apps that are supposed to be disabled on it will be disabled, there's nothing you can do about it. (If you're rooted, Market Enabler might let you spoof the country your device recognizes as its home, but I can't verify since my devices aren't.) On the upside, this seems like a mechanism put in place by Google for its own apps, so it doesn't look like any app developer can do the same. Thanks, Vojtěch Boček! And for the bit of info: my Pixel 2 XL eventually disabled YouTube Kids on its own. It took a lot longer than my Nokia 7 Plus to do it, probably lasting a day or more, but eventually the app disappeared from my app drawer.